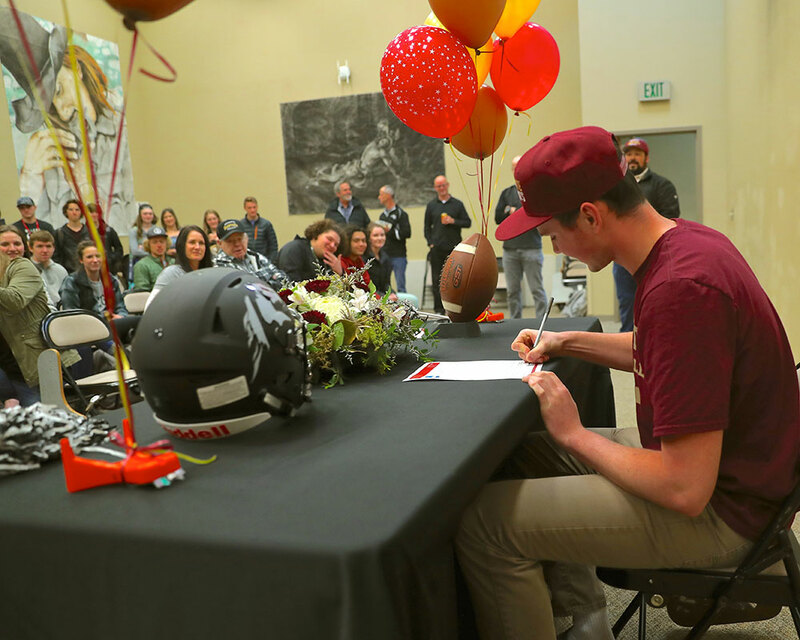 Wyatt Hernandez, a senior at Sisters High School, has signed with Willamette University in Salem to be the placekicker for their football team. Hernandez overcame significant adversity to stay in a game he loves. He was injured during a football practice his freshman year of high school. He suffered a severe concussion, which resulted in loss of memory, a severe speech impediment, and inability to read. Hernandez worked with speech therapists and with his teachers and family to return to normalcy and succeed in high school. He was told he was unable to play for the football team the rest of the seasons because of the severity of his injuries. However, he worked toward being able to play his senior year. "I love the game and my coach, and I wanted to play this season for my coaches and for my friends, so I worked at it to be able to do so," said Hernandez. Hernandez looked for any small way he could play the game and continue with the team. "I researched the kicking position and the ins and outs of it. I read articles and watched YouTube and worked at it all summer," he said. Hernandez is self-taught in the kicker position and worked at the end of the football season with a coach from Texas to hone his skills. Hernandez kicked over 200 balls over the summer. He played all season with the Sisters Outlaws as their kicker. "My mom always told me that everything happens for a reason and I took this as not letting anything define what I can and cannot do - and what I wanted to do was be on the team, so I worked for it," he said. For Sisters Athletic Director Gary Thorson, Hernandez is remarkable for his character as much as for his on-field accomplishments. "Wyatt is as good as they get when it comes to modeling character," he said in a Student of the Month tribute to Hernandez. "He has been a role model for so many of us here at SHS, both as a student and an athlete as well. During his time here, he has shown us how to be a great teammate, a servant to others, model student, and how to handle adversity. At all times doing so with a positive spirit, full of energy, and a great sense of humor. The Sisters community is blessed to have this young man in it." Hernandez was scouted by Willamette University and attended their recruiting weekend - and fell in love with the school. Hernandez originally wanted to attend OSU, until Willamette spoke with him and showed interest. "Willamette got in touch with me and said they were interested. I thought they had a great culture of a school and team environment," he said. Hernandez will start as prospective kicker for the Willamette U football team beginning his freshman year. He looks forward to continuing to play the game he loves, even if it's just for the year if he doesn't decide to continue forward with it in college. "I am so excited to play with the team that I met during recruitment," he said. Hernandez overcame the adversity of a severe injury - thanks to the support of his family, friends and coaches. "I am grateful to my friends, family and Coach (Neil) Fendall, and for my team for believing in me even when I didn't," he said. Hernandez' triumph proves, according to him, that "with good work ethic, you can set your mind to anything you want to do."